A guide for Sustainable Living in Swansea is available which contains many useful tips and contact details of local organisations that can help you. Although published in 2007 much of the information is still valid. However, some of the sites on the trail changed in 2012 so please refer to the updated version here for Trail site information. 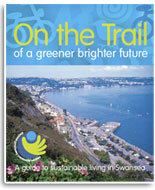 Check out the On The Trail Guide or On the Trail Guide - Welsh Version , or contact us for a free copy. Here are some easy and practicle ways to become more sustainable, with links to help you! • Use Sustainable transport more often - Why sit in stressful traffic jams, when you can zip past it in the bus lane or on the train! If everyone, just once a week made the effort to car share, walk, cycle, or use public transport, instead of using the car, it would greatly improve our local environment, and help towards the global challenge of climate change. Check out the Swansea Bay Alternative Travel Map to plan your journey. Why not try not to use the car for journeys less than 2 miles - 50% of all journeys made are less than 2 miles long! • Recycle - Use your green bags to recycle cans, glass and paper, your pink bags for plastic, the green bin for kitchen and food waste and your garden waste sack. Check the pages of the Council's Recycling Department for collection details or phone 01792 635600. These web pages have loads of information about recycling other products too. • Be Thrifty - Instead of buying new things such as household appliances, check out websites like Swansea Swap Shop or Freecycle to find FREE good quality items, and to get rid of things that you don't want anymore, but may be useful to someone else! These networks promote waste reduction, re-use, and reduce the pressure on landfill sites. • Re-Use - Take your old clothes to the charity shop and have a hunt for some new bargains! Check out the Green Map for a directory of all the charity shops in Swansea. Or why not organise your own 'swishing event' with friends or colleagues? • Save water! - Put a 'Hippo' bag (should be available from your water supplier) in the cistern of your toilet to save water with each flush and turn the tap off while you're brushing your teeth. • Be more energy efficient! Switch off appliances such as the TVs, laptops etc. when not in use and lights when you leave the room. Put an extra layer on instead of turning up the heating. • Switch your energy supply to renewable sources - Uswitch.com offers an independent Green Energy Guide and Tariff Comparison Service to make switching easy. • Reduce your food miles - Think about what you are buying and where it has come from; where possible buy local produce and support your local producers in shops and at markets - Check out the Food section of the Green Map. Or even better, why not cook more food yourself from scratch - you know exactly what is in it then! • Find out about your impact on the Earth - Check out your ecological or carbon footprint, and find ways to reduce it. • Volunteer or become part of a community group - get involved to help others and gain valuable new skills. Check out the Green Map and other Community Green Maps of various communities in Swansea to find Social Resources in your area, or contact Swansea Council for Voluntary Service (SCVS) to find out about all types of volunteer opportunities in Swansea. • Reduce the amount of junk mail you receive - by registering with the Mailing Preference Service.